Back pain is one of the most common ailments experienced in our culture. People living with back pain often go to great lengths in search of relief, from trying herbal remedies to taking scores of over-the-counter medications. However, some individuals have found that the simple poses practiced in yoga can alleviate mild to moderate back pain and reduce or eliminate the need to take pain pills. If you’re among the millions of Americans with chronic back pain, take comfort in knowing there are many non-surgical ways to manage this type of discomfort, one of which is controlled exercise in the form of yoga. This centuries-old discipline can effectively strengthen the core muscles, hamstrings, glutes, and lower back muscles that directly or indirectly support the spine—sometimes enough to effectively relieve pain. Yoga is gentle enough to promote the healing of back pain without significant risk of further injury. Hatha yoga in particular may be helpful for healing back pain by zeroing in on specific muscle groups. Many of the related poses also strengthen abdominal and hip flexor muscles. The relaxation many people experience from yoga’s combination of carefully controlled moves and deep breathing exercises (pranayama) may further ease back pain by reducing stress and anxiety. Keep reading to learn about a wide variety of yoga poses generally considered safe and effective for most people with back pain. In addition to strengthening the back and legs, this pose releases tightness in the muscle bands that run along the sides of the hips. Bend one knee to your chest while lying on your back. Place a strap or towel around the toes and arch of the outstretched foot. Lift the other knee if you get too much of a pull in your back. This is an excellent pose that works to fortify the lower back and strengthen the whole spine. The pigeon pose primarily stretches and strengthens the hip muscles. Tight hips are often a cause of lower back pain. Get on all fours and move one knee just behind the wrist on the same side while placing the lower leg diagonal to the other side. Extend your elbows, bend forward, and rest your forehead on your hands. Practicing the sphinx pose causes an increase in blood flow to the lower back, which allows muscle tension to release. While on your stomach, use your forearms to lift yourself up with your elbows beneath your shoulders. Assume a catlike pose while pressing yourself to the ground with your toes and palms. Move your pelvic bone forward to stimulate increased blood flow to your lower spine. An excellent source of relief for patients with sciatica, this pose can release the pinched nerve in some cases. The child’s pose stretches and releases back muscles that have tightened from overwork or stress. Lie on the floor and place your legs up against an adjacent wall. This position naturally removes excess fluid from the feet and ankles while relaxing lower back muscles. The pose can be done after a workout or physical therapy routine to relax your lower spine. Practicing the reclining twist realigns the spine and loosens tight lower back muscles. Rest on your back while extending both knees to your chest and stretch your arms out to your sides, then breathe deeply and slowly lower your knees. Hold the pose for a few minutes while keeping your shoulders down. Switch sides and repeat. Tight hamstring muscles can place added tension on adjacent lower back muscles. In turn, this can create more pressure on the sciatic nerve. The purpose of this pose is to strengthen and gently stretch hamstrings. A yoga strap is needed to correctly perform this pose. If you don’t have one, a rolled-up towel will suffice. This pose is performed by following these steps. Even if they’ve had a surgical procedure to relieve sciatica pain, such as a lumbar disc replacement, Santa Monica residents can gain a wealth of benefits from these poses and the breathing techniques involved in yoga. Both sedentary and active people can experience lower back pain but for very different reasons. Physical activity can place added stress on joints, bones, muscles, tendons, and ligaments supporting the spine from repeated use and exertion. Inactivity, on the other hand, can weaken muscles over time. Regardless of which category applies to you—realistically, most people fall somewhere in the middle—a 10-minute yoga workout like the one detailed below can contribute to strengthening back muscles. Get down on the floor with your legs under you and back extended forward and toward the floor, as if reaching for something with your arms stretched out. Start in neutral position on all fours. Balance on one leg, with the opposite arm on the floor for support. Get on all fours. Stretch forward so your body is in a straight line. Keep your elbows close to your ribs and slowly descend to end the pose. Assume the snakelike position by pressing your pelvis to the floor or mat. Position your hands beneath your shoulders and push your upper body up slowly to stimulate your lower back muscles. Press your pelvis to the floor as with the cobra pose. This time, extend your chin forward and lift your legs up from the floor. Start on all fours. Balance yourself on one arm, with your legs extended straight on the floor for support. Switch sides after taking a short break. Kneel down, then move your chest toward the ceiling while extending your arms backward to touch your heels and get a good spine stretch. If you’re unable to touch your heels, just place your hands on your lower back. Step into a lunge, with one leg completely extended backward. Place your hands together in a “prayer” position and extend your arms upward above your head while maintaining your balance. While sitting on the floor with your legs extended, stretch your arms forward. Flex your feet and move forward as far as you can comfortably go. Roll onto your back and go into a full corpse pose. This is the point where you can rest as you wrap up your 10-minute yoga sequence. If you have the energy, hug your knees and hold the position. If not, just breathe and relax. The strict attention to form required for most yoga poses may further ease your discomfort by improving your posture. However, it’s important to note that you should seek the approval of your physician or a Santa Monica spine surgeon before attempting any exercise for back pain, because certain poses may further exacerbate some injuries. Instruction on yoga should also be sought from a professional instructor. 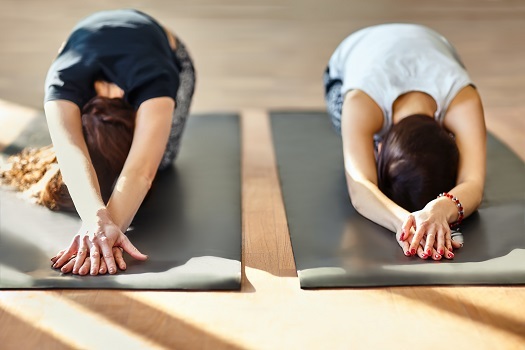 There are many diverse forms of yoga, and the variety of poses and techniques can offer almost everyone some relief from back pain. If you’re experiencing sudden, severe, or long-lasting spinal pain, make sure to consult a specialist for accurate diagnosis and prompt treatment. The pioneering physicians at The Spine Institute have experience with every aspect of neck and back health, so give us a call today at 310-828-7757 to schedule a consultation.